The Data centre at INFLIBNET Centre is designed as the most robust setup and less prone to failures and also to host mission critical servers and computer systems, with fully redundant subsystems, wherever possible, such as cooling, network links, storage, fire wall, power etc. and compartmentalized security zones controlled by biometric access controls methods. All components are fully fault-tolerant including uplinks, storage, chillers, HVAC systems, servers etc. Everything is to be dual- powered in a Tier 3 standard data centre. The INFLIBENT Centre uses HP Blade System C 3000 Enclosure for hosting Web Services, INFLIBNET website, Shodhganga, OJAS, NLIST, InfoPort, e-PG Pathshala, IndCat, DNS server, Intranet server, etc. 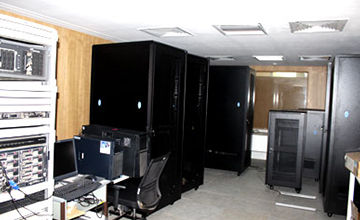 IBM Blade Centre S chassis along with fully populated servers and storage is used for Web co-location services at BSNL, which host mirror sites of INFLIBNET Centre for the services such as UGC website, NLIST Proxy Server, Online UGC Scholarship scheme and other important services. Virtual Core Switching Technology and Intelligent Edge Switches Virtual core switching technology at INFLIBNET Centre is used in the data center for increase bandwidth, reduce complexity and create an active mesh between server and switches in the LAN. Layer 2 based edge switches (ie. CISCO Catalyst 2960s) are used in INFLIBNET's Data Centre to improve security, sustainability and borderless network experience which include new flex and data stacking capability provides a unified data plane, configuration, and single IP address management for a group of switches with 1 to 100 Gigabit of throughput connectivity and PoE+ (Power over Ethernet Plus) by offering fast Ethernet access connectivity and removes the need for wall power to each PoE-enabled devices. These switches also support Virtual Local Area Network (VLAN) and DMZ (demilitarized zone) between private network and the public network through UTM. The INFLIBNET Centre is using structured cabling with 40G ready network, 100G road map backbone network built with CAT 7A and Optical Fiber wiring that can carry and accommodate data, voice, multimedia, security data, VoIP, PoE and wireless connections throughout the building in the campus. Well planned and designed CAT 7A structured cabling backbone network system empower performance of up to 1000 MHz continuous flow of information, support the sharing of resources and promotes smooth operations. Optical Fiber uplinks is used to connect various switches. The whole network is configured with a centralised core switch (ie. CISCO NEXUS 7004) to manage its network operations. The switch offer high-density 10, 40, and 100 Gigabit Ethernet with application awareness and comprehensive performance analytics for the data centre. It also deliver high performance and density for core, aggregation, end-of-row, and top-of-rack server deployments in a highly resilient modular platform. A switch which is designed for the most mission-critical enterprise and service provider data centre deployments is chosen for the INFLIBNET Centre. The INFLIBNET Centre uses a high-performance and reliable Unified Threat Management (UTM) from FortiGate which has built-in hardware and software that helps to screen out the network with the fastest firewall technology to provide protection from hackers, viruses, and worms over the Internet and dynamic network environment. Firewall is also capable of Layer 4 functionality of the OSI Model, which are capable of packet-forwarding and identifying which application protocols are included with each packet, and it uses this information to send the packet to appropriate client/node and also provide an effective security and flow control by traffic filtering and forwarding the packets. The hosting server at INFLIBNET are placed in a zone call DMZ (Demilitarised Zone) area by creating virtual hosts with private and local IPs. The firewall technologies has an integrated high performance protection system against wide range of threats, creating VPN technology, ensuring data privacy between multiple networks and host using SSL VPN protocols, Anti-Virus, Web application filtering, Intrusions Detection and Prevention System (IDS/IPS), anti-spam and traffic shaping to deliver multi layer security. IP Telephony system at INFLIBNET Centre is an Internet Protocol (based) phones, which can help to improve productivity of telephony services with specialised software and hardware. Software system provides IP phone service through an application that allows phone calls to be made from any computer with a sound card. The whole telephone system is part of low voltage solution offered by M/s Siemens to INFLIBNET Centre. It uses proprietary software called 'My portal' which is installed in all PCs connected with IP phones through RJ 45 connector and Ethernet cables. The INFLIBNET Centre is connected to the National Knowledge Network (NKN) /NME-ICT project that provides 1 Gbps MPLS (Multi Protocol Layer Switching) connectivity to all universities in India. The INFLIBNET Centre is having two Internet connections i.e. one from NKN and other from BSNL for standby purpose. This gives redundancy to Internet links which is essential in an organisation which has a Tier 3 Data Centre. Building Management System (BMS) integrates the mechanical and electrical equipment used for various services such as ventilation, lighting, power system, fire system and security system. BMS consists of software and hardware in a computer- based control system installed in a building that controls and monitors the above mentioned equipment. INFLIBNET Centre uses HVAC (Heating, Ventilation and Air Conditioning) for indoor environmental comfort based on the principle of thermo dynamics, fluid mechanics and heat transfer, ensuring maximum levels of efficiency and economy. This is achieved by maintaining the optimum balance between environmental conditions, energy usage and operating requirements. a DDC controllers (Digital Direct Controls) distributed with field devices such as voltage sensors, temperature sensors, smoke dictators, fire dictators, etc. INFLIBNET Centre uses Honeywell Trend for the BMS Solutions. Surveillance is the monitoring of the activities, behaviour and other field conditions for managing, directing or protecting employees as well as outsiders. This is done generally by observing with the use of an electronic equipment such as CCTVs (Closed-Circuit Television) cameras. This also helps to maintain the security of the building. CCTV cameras are generally attached to a storage device which can archive video captures of all cameras and preserve it for later use. The number of CCTV cameras to be used depends upon the size, magnitude, layout and orientation of the building. 28 CCTV cameras from M/s. Honeywell are used in the surveillance system installed in the INFLIBNET Centre. All cameras are IP-based, advanced and PoE (Power on Ethernet) enabled. The Centre is equipped with a Public Addressing System (PAS) with centralized control for the sound management. The auditorium of INFLIBNET Centre is equipped with professional sound system with premium ultra high headroom analog mixer and state-of-art mic preamps with DSP with 100 presets including reverb, chorus, flanger, delay, pitch shifter and various multi effects with alteast 12 channels for audio devices like mics (i.e. collar, hand-help, audio mike, cordless and vocal instrumental), laptop, CD/DVD player or music instruments, media players, etc. The mixer is connected with sufficient amplifiers for Base (Woofers), FOH (Front of the House), surround speakers, cross over amplifier for balancing the gain of audio and stage monitor speaker with plug and play facility. The auditorium is also be equipped with Wi-Fi hotspot. This audio system is synchronized with video projection facility having high quality projector (7000+ ANSI luminance, ceiling mounted projector with remote controlled dropdown lift). The motorised projection screen is wide enough (22 x 12 ft) to display the video projection for the clear view of all the people from various angle in the auditorium. The Centre has dedicated video conferencing setup with sound-proof room for multi party conferencing with high definition resolution camera with codec, multi point control unit and HD LCD/LED TV for display. The Video Conferencing facility has been made available by Cisco Telepresence C90 which is one of the most powerful, flexible telepresence and collaboration engine delivering up to 1080p end-to-end high definition video, HD collaboration and HD embedded conference capability with multisite technology.